Location: Tirumullaivayil near Avadi . This is one of the Shivastalas in the vicinity of Chennai, near Avadi. It is considered special to worship Kodiyidai Nayaki here and Vadivudai Nayaki at Tiruvotriyur on full moon days. Ramalinga Adigalar refers to Shiva here as 'Mullaivayil Vaazh Masilamaniye'. Ten Tirumullaivayil is another Shivastalam with the same name Mullaivayil, in Chola Naadu. Tirumullaivayil is the 22nd of the 32 Tevara Stalams in the Tondai region of South India. Legends: Nandi is said to have accompanied a devout King Tondaimaan in his battle, per the grace of Shiva. The feet of his elephant supposedly got entangled with the mullai creeper here; and when the obstacle was removed, the Shivalinga was revealed. Sage Sundara is said to have worshipped here first after losing his eyesight. 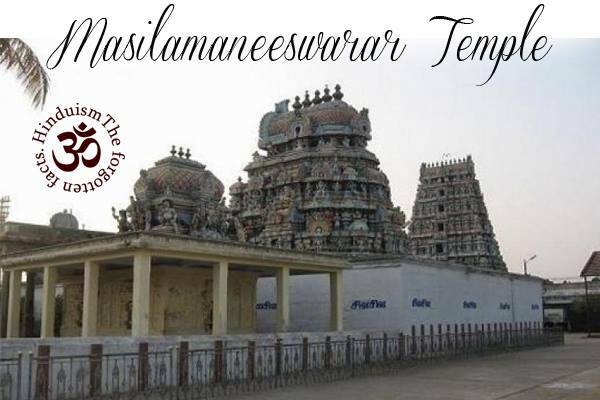 The Temple: This temple with a gajaprishta vimaanam common to this region occupies an area of about 1 acre . A grand Rajagopuram forms the southern entrance to this temple visible from a distance. The sanctum here has been in worship since the Sangam period. There are shrines to Rishabantikadevar, Natarajar and Bhikshatanar here. Elements of Pallava architecture are seen in this temple as in the lion pillars in the Vinayakar shrine. The nandi faces away from the sanctum in keeping with the legend. There are two Erukku pillars in front of the sanctum. Inscriptions from the period of Uttama Chola, speaking of Sembiyan Mahadevi's (10th century)endowments to this temple, are seen in this temple..
Festivals: The annual Bhrammotsavam is celebrated in the month of Vaikasi (Taurus), and Vasantha Utsavam in Aani. .